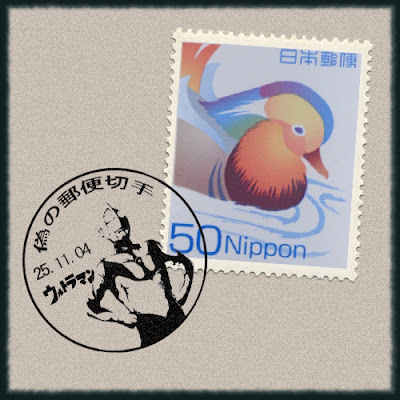 The Japan News announced today that six postage marks will commemorate Tsuburaya Productions' 50th anniversary. Tsuburya is most famous for it's Ultraman series, but they are also known for Kaiju Booska and other tokusatsu-style entertainment. Read the Japan News excerpt below. SUKAGAWA, Fukushima—Postmarks featuring superheroes from the action TV series “Ultraman” have been introduced at six post offices in Sukagawa, Fukushima Prefecture, where Eiji Tsuburaya (1901-70), the creator of the Ultraman series, was born. Tsuburaya is also the founder of Tsuburaya Productions Co., a Tokyo-based firm that produces special-effect movies. The unique postmarks, which started being used Friday, are special to the birthplace of the superheroes’ creator. There are postmarks nationwide that feature sites and landscapes unique to the areas concerned. To mark the 50th anniversary of Tsuburaya Productions this year, Sukagawa established a “sister city” relationship with the M78 nebula, which is considered the homeland of Ultraman and other superheros.